1. Answer – B. Arthritis is characterized by joint inflammation that is usually accompanied by pain and frequently accompanied by changes in structure. Synovitis is the inflammation of the synovial membrane, typically resulting from a traumatic injury or an aseptic wound. Bursitis is the inflammation of a bursa, typically one located between a bony prominence and a muscle or tendon. Tendinitis is the inflammation of tendon. 2. Answer – C. Hemoptysis is the expectoration of blood from the respiratory tract. A hemorrhage is abnormal internal or external bleeding. Hematopoiesis is blood cell formation. Hemopexis is blood coagulation. 3. Answer – B. Ataxia is lack of coordination in performing planned, purposeful movements, typically resulting from a neurologic deficit. Apraxia is the inability to perform purposeful movements even though no neuromuscular deficit exists. Fasciculations are fine twitching movements. Myokymia is a transient, spontaneous movement that occurs in muscle groups after strenuous exercise. 4. Answer – D. Hypercapnia is an elevation in the partial pressure of carbon dioxide in arterial blood (PaCO2). Hypernatremia is an elevated level of sodium in venous blood (more than 145 mEq/liter). Hypocalcemia is a decreased level of calcium in venous blood (less than 9 mg/dl). Hypoxemia is a reduced level of oxygen in arterial blood (less than 80 mm Hg while breathing room air). 5. Answer – B. The combining form penia means deficiency, as in thrombocytopenia (deficiency in the number of circulating blood plates). Rrhexis is a combining form meaning rupture, as in enterorrhexis (rupture of the intestine). Plast is a combining form meaning formation, as in rhino-plasty (formation of a nose using plastic surgery). Narco is a combining form meaning stupor, as in narcolepsy (a condition marked by recurrent attacks of drowsiness and sleep). 6. Answer – B. Fluid volume deficit related to fever is the appropriate nursing diagnosis based on this assessment. Potential for impaired skin integrity states a possible patient response. Potential for fluid volume deficit caused by fever implies a cause-and-effect relationship, which a nursing diagnosis should never do. Altered cardiopulmonary tissue perfusion related to fluid excess is an incorrect diagnosis based on a misinterpretation of the data. 7. Answer – D. A nursing diagnosis is a statement about a patient’s actual or potential health problem that is within the scope of independent nursing intervention. Medical terminology is never a part of the nursing diagnosis. An appropriate nursing diagnosis would be ineffective breathing pattern related to chest pain rather than ineffective breathing pattern caused by angina. 8. Answer – D. A water-soluble lubricant must be applied to the tip of the catheter to decrease friction and the risk of injury to the patient’s nasal mucosa. (If petrolatum or mineral oil were applied to the catheter and then aspirated, the patient could develop a lipoid pneumonia) The distance from the tip of the nose to the tip of the earlobe is the approximate distance from the point of insertion to the oropharynx. Sterile distilled water must be used to humidity the oxygen because oxygen administered by itself is a dry gas that can irritate the mucosa. 9. Answer – A. Patient safety is the major concern in this situation. According to the International Council of Nurses’ Code for Nurses: “The nurse [should] take appropriate action to safeguard the individual when his or her care is endangered by a co-worker or any other person.” In this case, talking with the head nurse immediately would be the best way to safeguard the patient’s safety. The nurse isn’t necessarily an addict, she may be abusing a prescription medication. 10. Answer – D. It is the staff nurse’s responsibility to be on time. The nurse manager should not assume a responsibility that belongs to the nurse. 11. Answer – D. Although Medicare and Medicaid regulations and suggestions made by such groups as the National Kidney Foundation may serve as guidelines, a hospital’s procedure manual details how the nurse should perform her specific duties. A state’s nurse practice act defines the scope of practice within that state, but not the specifics for each area of practice. 12. Answer – A. The three elements necessary to establishes nursing malpractice are nursing error (administering penicillin to a patient with a documented allergy to the drug), injury (cerebral damage), and proximal cause (administering the penicillin caused the cerebral damage). Applying a hot water bottle or healing pad to a patient without a physician’s order does not include the three required components. Assisting a patient out of bed with the bed locked in position is the correct nursing practice; therefore, the fracture was not the result of malpractice. Administering an incorrect medication is a nursing error; however, if such action resulted in a serious illness or chronic problem, the nurse could be sued for malpractice. 13. Answer – B. Therapeutic communication is a two way, deliberative interaction between the patient and nurse in which they establish mutually acceptable, achievable goals of care. Before the patient can feel comfortable discussing his problems, however, and atmosphere of trust and acceptance must be established. 14. Answer – C. Many variables affect patient nurse communication, including the patient’s cultural beliefs, experiences with hospitalization, age, emotional needs, and problems with speech, hearing, or comprehension. A patient admitted to the hospital for the first time for a scheduled cesarean section is probably anxious, but she had time to plan for the procedure, does not bring negative experiences from previous hospitalizations, and in most cases looks forward to the birth. 15. Answer – D. Therapeutic communication is a fundamental component at all phases of the nursing process. In the planning phase, it allows the patient and nurse to formulate mutually acceptable and patient-oriented goals, which are the basis for developing an individualized care plan. In the implementation phase, effective communication is necessary for teaching the patient, motivating him to achieve goals, and assessing patient outcomes. Finally, in the evaluation phase, it is required to determine how well the patient has responded to interventions. 16. Answer – C. Objective data are those which can be measured, like glucose levels. A complaint of polydipsia is subjective information obtained from the patient. 17. Answer – D. Peristalsis is the muscular, rhythmic movement in the bowel wall that pushes food along the digestive tract distally. Increased bowel motility is indicated by rapid, high-pitched, hyperactive bowel sounds. Decreased bowel sounds, caused by decreased bowel motility, can be the initial sign of paralytic ileus (adynamic intestinal obstruction resulting from the lack of peristalsis), a common occurrence following abdominal surgery. 18. Answer – D. The use of a tilt table for weight-beating exercises, parenteral nutrition, and vitamin therapy are not independent nursing interventions because they require a physician’s order. Unless specifically contraindicated, the independent nursing interventions listed in A, B, and C may be part of the nursing care plan for an immobilized patient. 19. Answer – A. Independent nursing interventions for a patient with pressure ulcers commonly include changing his position several times each day to avoid pressure to any part of his body, especially the involved area. Drying agents, which are prescribed by a physician, are contraindicated because wounds need moisture to heal. Whirlpool therapy and chemical debridement must be prescribed, and surgical debridement is done by the physician. 20. Answer – D. All of the choices will help the nurse determine the extent of the problem. For example, asking how the patient felt about her body before hospitalization will help the nurse determine whether the disturbed body image is a crisis brought on by the weight gain or a long-standing problem. Asking what the change means to her will reveal whether she feels she has control over what is happening or believes the change is permanent. Body image is also related to how we think we compare to others or whether others find us attractive. 21. Answer – C. Because aldosterone regulates the body’s sodium and potassium levels, it acts as an adaptive mechanism in maintaining blood volume and conserving water. Supplemental potassium usually is given to a patient with a low serum potassium level or one who is receiving a diuretic or other medication – such as digoxin – that has a mild diuretic effect. A low-sodium diet is usually prescribed for a patient with a high serum sodium level, as in congestive heart failure (CHF), hypertension, or prolonged episodes of edema. Diuresis is increased naturally when a healthy patient increases his intake of fluids, especially those containing caffeine. Patients receiving diuretics also experience increased diuresis. 22. Answer – D. Interviewing the patient – in both a structured and an unstructured format – is an important part of the initial nursing assessment. 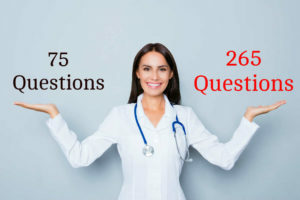 The structured format uses questions that require a yea-or-no answer to help the nurse obtain information; the unstructured format uses open-ended questions that allow the patient to express himself more fully. The interview helps the nurse and patient identify the stressors and develop appropriate outcomes. 23. Answer – C. Calculating the difference in weight between a dry pad and a urine saturated pad using conversion calibration will provide an accurate measure of urine output. For example, if the difference between the dry pad and the urine-saturated pad is 200 g, the urine output would be 200 ml (1g = 1 ml). The other methods will provide only an estimate of urine output. 24. Answer – C. Disturbances in self-concept may manifest themselves as signs and symptoms of depression, such as changes in sleep patterns, eating habits, and energy levels. The other nursing diagnoses are not supported by the given situation. 25. Answer – C. An appropriate nursing diagnosis for a patient with excessively dry skin is Impaired skin integrity (actual not potential) – in this case, related to dehydration because the patient complains of thirst. Altered circulation is not usually an etiologic factor for dry skin. Thank u for nclex web sit.